Hallucinogens are drugs, some naturally occurring , others synthetically created in the laboratory, products that can be classified into three categories: psychedelics, dissociatives, deliriants. These are all psychoactive compounds, able to cause subjective changes in perception, emotion, consciousness and thought. Many drugs contain similar components which are the main active ingredient, provoking the altered state (see post: Altered States of Consciousness). Dimethyltryptamine (DMT), for instance, is the principle 'psychedelic' contained in ayahuasca; mescaline is the main ingredient in Peyote and San Pedro Cactus (see post: Drugs Used in Religion-The New World). But even outside of 'exotic' regions of the world, there are plants which can be used for 'mind-altering' effects, plants that, literally, grow at the side of the road. 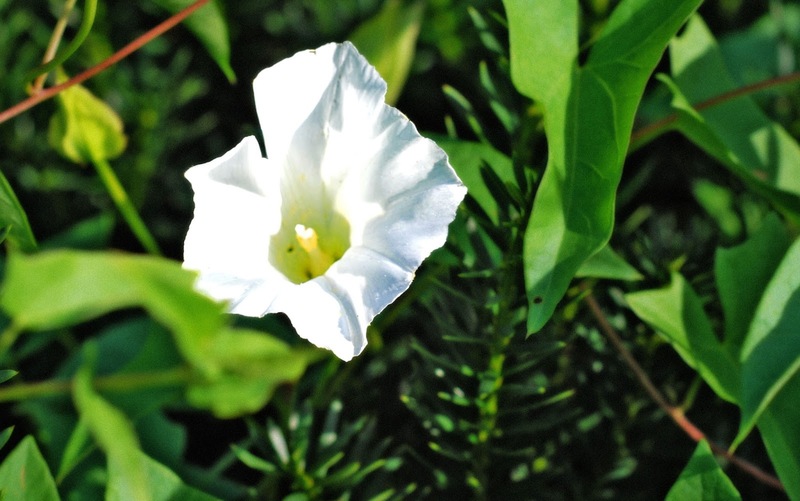 The Morning Glory is a beautiful and common plant found in many gardens throughout North America. The seed of many species of this plant contain ergot alkyoids, a chemical whose structural skeleton is similar to that of the synthetic psychedelic drug lysergic acid diethylamide (LSD). Derivatives of ergot alkyloids are used medically in the treatment of migraine headaches as well as Parkinson's Disease (see post: The Genetics of Drug Addiction). Mushrooms have been a popular source of psychedelic drugs for thousands of years. Psilocybin mushrooms have been used both in the 'New' and in the 'Old' worlds. Muscimol, found in the mushroom amanita muscara or 'Fly Muscaric' (see post: The 'High' Priest) has been in use in Northern Europe and Asia for centuries. The same ergot alkyloids which are found in Morning Glory seeds are also found in several different types of fungi (mushrooms) that commonly infect grains such as rye. 'Ergotism' caused by the ingestion of these ergot alkyoids can produce psychedelic 'trips' (hallucinations), nausea, unconsciousness, seizures, peripheral blood supply compromise and gangrene as well as provoke abortions. 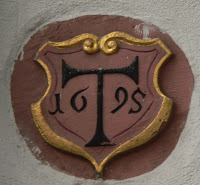 'Saint Anthony's Fire' was the name given to these symptoms of ergotism, a tribute to the Viennese monks, The Hospital Brothers of St. Anthony (founded 1095), who specialised in the treatment of this problem. This same ergot compound may have been the psychoactive ingredient used by participants in the Eleusinian Mysteries (see post: Drugs Used in Religion-The Old World). 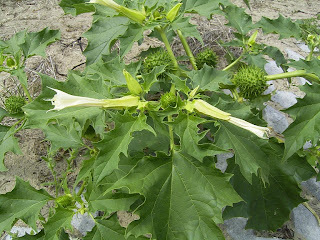 'Datura Stramonium' is a weed that belongs to the 'nightshade' family and is more commonly known as 'Jimson weed', 'stink weed' and 'devil's trumpet'. 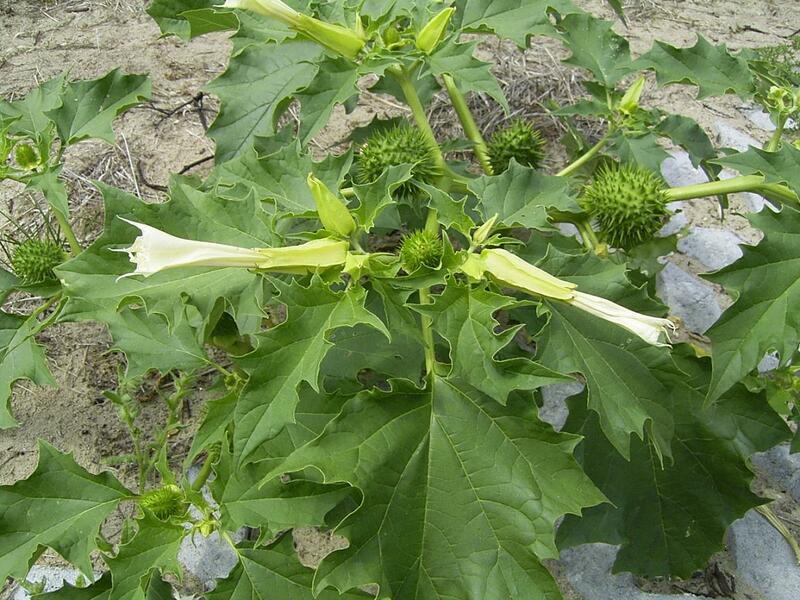 The active compounds in datura are 'tropane alkyloids' such as atropine, scopolamine and hyoscymine. This weed has been used in religious rituals in Asia as well as Native North America since ancient times. The effects of the plant include confusion, inability to discern between reality and fantasy, rapid heart rate, increased body temperature, light sensitivity and amnesia. Tropane alkyloids are also the active ingredients in Mandrake root, henbane and deadly nightshade. 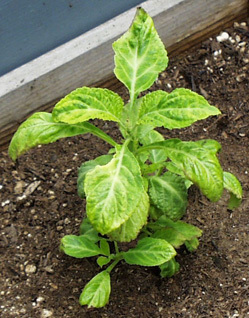 'Salvia Divinorum' (Diviner's Sage, Seer's Sage) is a psychoactive plant which can induce dissociative effects (much like the anesthetic ketamine) and is a potent producer of "visions" and other hallucinatory experiences. Salvinorin A is the active compound in this herb. Smoked, chewed or swallowed, this 'diterpene' hallucinogen can result in 'overlapping' realities, visions of 'membranes' wrapping the surroundings, re-experiencing of past memories, uncontrollable laughter, sensations of motion or 'merging' into surrounding objects. 'Nutmeg', the same 'spice commonly used in our foods and pastries, is a product of sub-tropical regions such as India. In low doses, the seed of the nutmeg (essential oil of nutmeg) produces no noticeable physiological or neurological response, but in large doses, raw nutmeg can cause convulsions, palpitations, dehydration, generalised body pain and delirium. 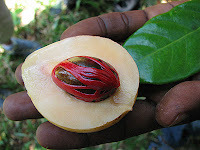 Nutmeg contains myristicin (a phenylpropene) a compound which is also found in lesser quantities in parsley and dill). Myristicin is a mono-amine oxidase inhibitor, a substance that is a principle component of many older types of anti-depressant medication. Then there is the 'Colorado River Toad' (also known as the Sonoran Desert Toad), native to Northern Mexico and the U.S. Southwest. 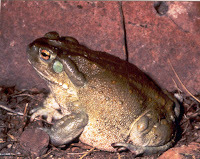 This amphibian is most often found in streams, canals and drainage ditches (literally, at the roadside). The venom and skin secretions of these toads contain a variant of the tryptamine DMT (the same active compound as in ayahuasca) as well as bufotenine, a drug similar to the neurotransmitter, serotonin. Ingestion of the saliva or skin secretions can produce hallucinations and the 'way-out' trips that the shaman of the Amazon experience when they ingest ayahuasca (see post: Drugs Used in Religion-The New World). There are many more naturally occurring products in Mother Nature's Psychedelic Roadside Drug Store and, when on a road trip to any unfamiliar territory, it is always wise to check what 'new and delightful' leaf (or toad) might have found its way into your salad.